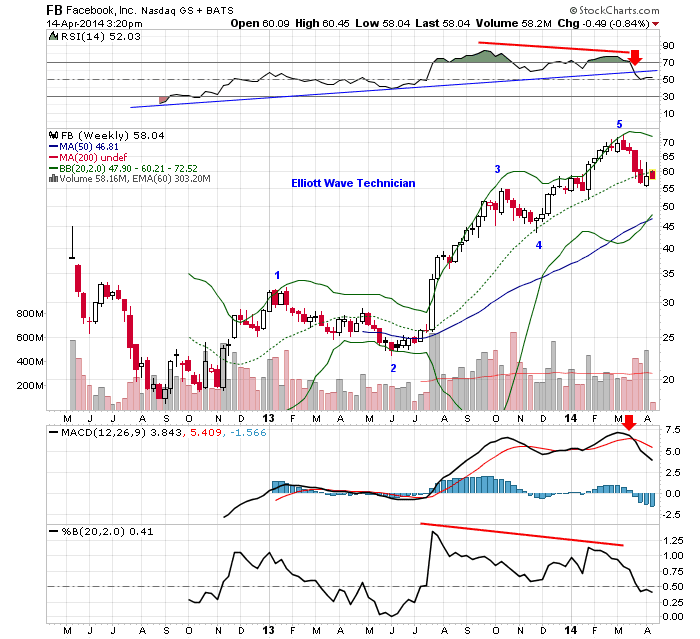 Facebook display a complete Elliott Wave structure in 5 waves up from the last major bottom in September 2012. The Elliott Wave count is marked with blue color on the weekly chart under. The rally lasted more than one and a half year so the correction in progress should last at least a few more months if it is going to be in proportion to the rise. On the technical indicators both RSI and #b displayed clear negative divergence at the recent top of wave "5" compared to the previous top of wave "3". The divergence is marked on the chart with a red line connecting the two tops. It is typical of a 5th wave to end with lower momentum then wave "3" . A common initial retracement is were wave "4" bottomed or around USD 45. A more interesting question is if this complete a one larger degree Elliott Wave structure as well. If so then the initial retracement is USD 18 - 20 were the larger degree 4th wave bottomed. If you want to know if we believe this is the case, subscribe to our investment newsletter.